This August's theme release is a special one for us. Luna comes with a vibrant, colorful design that doesn't need big images to impress. The typographic teaser makes a grand opening, while four custom Widgetkit plugins help you to bring out your content. 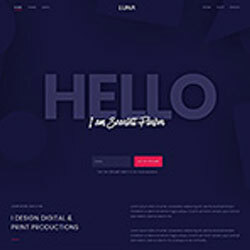 In addition, Luna's styles are extra sophisticated, including beautiful background effects. Each one was crafted with loving detail, essentially making them mini themes themselves.